Questions, Answers & Solutions – What's Your "-IT-"? Je’mere Heyward, Founder & CEO of Building Safer Communities, LLC is commited to getting the good news out and into the streets. 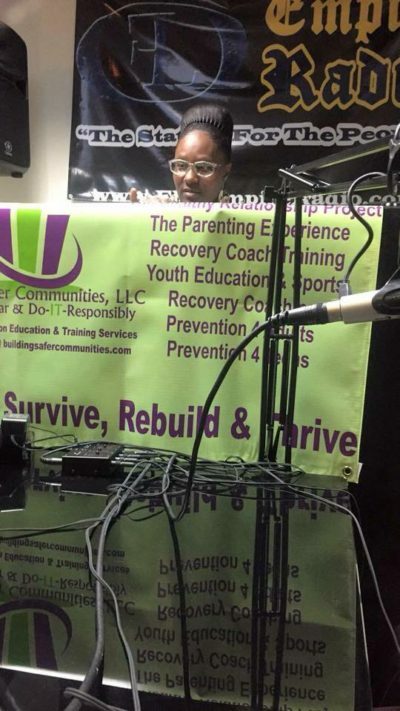 Everyone needs to know about what’s going on in the community, related but not limited to, prevention services in effort to it reduce incarceration, all acts of domestic violence, child abuse & neglect, driving under the influence of drugs and or alcohol and other related problems that have a negative impact on our communities. Je’mere also explores what it means to train as and become a recovery coach to support those recovering from all forms of addiction, positive figures in the community and creates a plateform for positive influences. What better way to do it, than opening up the line of communication via internet radio. Je’mere’s mission is to set a wave of positivity one person, one family and one community at a time. She’s bringing to the for front conversations filled with support from real life people and their stories on how to Adapt, Survive, Rebuild & Thrive. In addition, we bring in resources from City, State & Government officials and programs; Information from active and aspiring business owners on how to Look up, Sit up, Stand up, Work to stay up and Speak up, as well as but not limited to, Discussing Solutions on how to Raise the Bar & Do-IT-Responsibly® despite adversity. To book a seat for one of our conversations and/or to share an idea, send all inquires to buildingsafercommunitieslr@gmail.com for a prompt response.